The client came to us after ending a three year engagement with another SEO who couldn’t move the needle on their “big money” terms. The client’s site is based on a complicated CMS that claims to be SEO Friendly, but really isn’t. We worked to ensure the site was as good as it could be within the constraints of the CMS. We worked through an extensive process of getting the CMS patched to clean up the code as much as possible while implementing some SEO best practices. One of the biggest challenges was dealing with loads of duplicate product descriptions since many parts are interchangeable between different years, makes and models. The writing was on the wall – search volume for their top terms were on the decline. The client’s previous SEO had all their eggs in one basket. We increased their ranking for the top-performing key phrases as well as gained them exposure for hundreds more lower-traffic phrases. In the end, we insulated them against massive losses in traffic they would have seen because of the continued downward trend. The graphic below shows the historical search volume for the client’s biggest phrase. Notice the substiantial decrease in the amount of people using that search term. The graphic below compares the site’s traffic during the period of 1/1/10-6/30/10 to 1/1/11-6/30/11 This is the same period you see in the previous graphic. 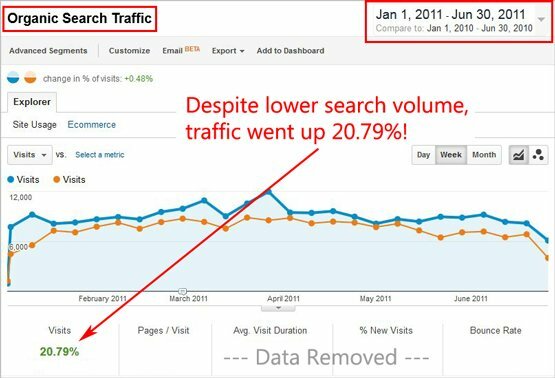 Notice that our client’s traffic does not drop like a rock the way search volume did. Had they stayed with their previous SEO, their traffic would have tanked. Contact us today to find out how we can start setting traffic records for your site too!